With 85 percent of precincts reporting, Rawlings, who went into the race with a significantly larger bankroll than his challenger, holds a nearly 50-point lead over challenger Marcos Ronquillo. Rawlings' son introduced him to the podium at about 8:15 p.m. Saturday evening, alongside his daughter and wife. According to The Dallas Morning News nearly 70 percent of voters told a recent poll by the paper "the city was heading in the right direction and, though many more voters disliked the toll road than liked it, nearly five times as many gave a thumbs up to Rawlings as a thumbs down." 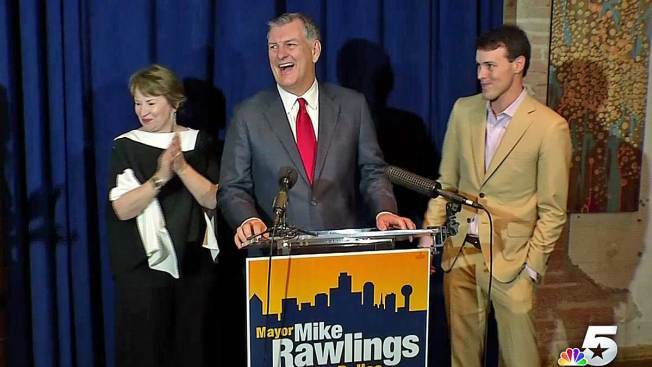 Rawlings was first elected to the mayor's office in 2011 after defeating former Dallas Chief of Police David Kunkle when incumbent Tom Leppert decided not to run for reelection. See the returns from more than 300 local races here.